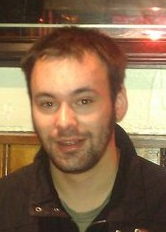 Oliver Coles is currently an astrophysics Ph.D student at University College London having worked with liquid crystals for his MPhil at The University of Manchester. His MPhil research, under the guidance of Prof. Helen Gleeson, was directed towards the use of nematic liquid crystals within the capillaries of photonic crystal fibres. These liquid crystal infiltrated fibres have tunable optical properties and the aim of the work was to create devices with which to sense electric fields. His current studies concern the design and construction of large scale spectroscopic instruments and adaptive optics, which may well in the future require the use of liquid crystals. 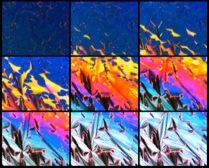 Stills from a video of smectic A to cholesteric phase change at 20x magnification. The cell has surfaces treated for homogeneous alignment and is placed between crossed polarisers. Jury comment: Seasons in a liquid crystal cell: watch the transition of textures that mimics colored autumn leaves followed by the onset of icy crystal growth in this set of images.